A Triple Crown race, this American flat race is held annually at the Pimlico Race Course in Baltimore, situated in Maryland, US. The Preakness Stakes is a Grade I race run on a dirt course over a distance of 9.5 furlongs. It takes place every year, sandwiched inbetween the Kentucky Derby and the Belmont Stakes (two weeks prior and after these two other Triple Crown races). The Preakness Stakes race is referred to as the run for the ‘Black Eyed Susans’ due to the custom of laying a blanket of yellow flowers which resembles Maryland’s state flower onto the winner of the event. The idea for the race came to the forefront two years after the first running of Kentucky Derby during the spring meeting in 1873. The event had taken its name from the Maryland governor Oden Bowie who wanted to honour the Dinner Party Stakes winner colt Preakness. 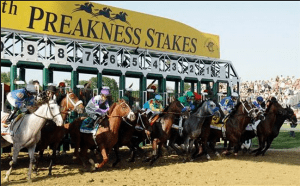 The Preakness Stakes saw the first running in the year 1873 after which the 143th race occurred in May 2018. After Preakness won the Dinner Party Satkes, a bag of gold coins hanging from a wire that stretched across the track was untied by his jockey. This was for a time thought to be the birth of the custom of handing over the prize money to the winner popularly known as a ‘purse’, though this is contested by many. It’s also thought to be the origin of the wire / tape across the finish line at some racing events. Forming the second leg in the Triple Crown series, the Preakness Stakes is one of the major attractions of racing for those wanting to make a name for themselves, or even stake a claim to the Triple Crown itself by winning all three races, a rare feat achieved only 13 times in the last 100 years. The Preakness Stakes, Kentucky Derby, and the Belmont Stakes run on courses at a distance of 9.5 furlongs, 10 furlongs, and 12 furlongs respectively. The events have been tinkered with over the years in order to make them fit together is perfect fashion and make for a triple dose of top class racing.